It's almost Christmas, and after skipping a week, Back of the Box is back! 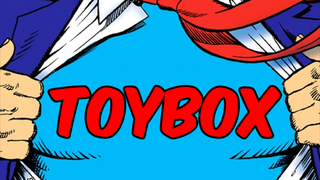 Let's take a look back at the last week on Toybox, shall we? December's been rather kind to Toybox so far, but the last week especially has seen a high trend of successful days that's even staved off a major traffic spike leaving monthly tracking from new the end of November - in all this week, the site's sitting on a healthy 680K US monthly people, well above the requirement for a recruit, which I technically still am despite being well into my fourth month of operation. God, four months. Time flies, doesn't it? Feels like I've hardly started! There was a distinct Spider-hero flavour to this week, with both a look on why Sony potentially ditching Andrew Garfield could be one of their biggest mistakes with the Spider-Man movie franchise, as well as the unveiling of Spider-Woman's first new costume in her entire comics tenure sparking a discussion of whether we should be seeing more heroes moving towards the 'practical' costume style. A mid-week break saw us take a look at the twisted genius of Black Mirror's Christmas special, and as ever, there's been lots of lovely Toys and fan creations to ogle over as well. Here's the week that was on the site! Are We Entering The Age Of The Practical Superhero Costume?